Aneomes are part of the Phylum Cnideri, which includes corals and jellyfish. Their name comes from the Greek word cnidos which means stinging nettles. Most animals in this phylum have a capability to sting prey with nematocyst cells which either sting or inject a toxin. A sea anemone is a polyp attached at the bottom to the surface beneath it by an adhesive foot, called a pedal disc, with a column shaped body ending in an oral disc. Most are from 1.8 to 3 centimetres (0.71 to 1.2 in) in diameter, but anemones as small as 4 millimetres (0.16 in) or as large as nearly 2 metres (6.6 ft) are known. They can have anything from a few tens of tentacles to hundreds. When the hair is touched it mechanically triggers the cell explosion, a harpoon-like structure which attaches to organisms that trigger it, and injects a dose of poison in the flesh of the aggressor or prey. This gives the anemone its characteristic sticky feeling. The sea anemone eats small fish and shrimp. Anemones tend to stay in the same spot until conditions become unsuitable (prolonged dryness, for example), or a predator attacks them. 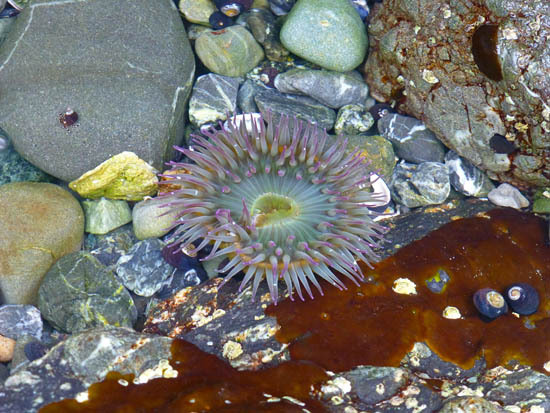 In that case anemones can release themselves from the substrate and use flexing motions to swim to a new location.